It's been a long long time since I had a hangnail last time. 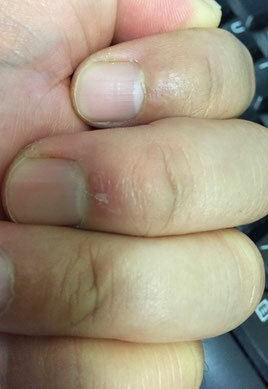 A hangnail is called "Sasa-kure" or "Saka-muke" in Japanese and there is a very famous superstition about "hangnail." That is, hangnail will come out whenever you are disobedient to your parent. Another superstition says, if you revolt against your father, you'll get a hangnail! Well, I am not a superstitious person. Rather I can enjoy to learn various superstitions and their origins. However, can you believe what really happened to me? Believe it or not, this superstation about hangnail apparently became true. The truth was I might have treated my father disrespectfully. Then I got an hangnail. Maybe, you might be curious how can a Buddhist minister treat his father (minister) badly. First, I was so surprised to know my father has just started Facebook! Then he sent me a friend-request!!! But I deleted this request so soon.....and after 3 days, I got an hangnail. I'm supposed to be open and welcome any request... but this was my first time I deleted a friend-request. Am I a bad son? But I have a reason to reject. If my father asked me the reason why I didn't approve, I would definitely answer like this. "Hey dad, you are not my friend! You are my father! Right?" Very great post. I simply stumbled upon your weblog and wanted to mention that I have really enjoyed browsing your weblog posts. After all I will be subscribing on your feed and I am hoping you write again soon! What's up, just wanted to mention, I loved this article. It was inspiring. Keep on posting! Wow! This blog looks just like my old one! It's on a entirely different subject but it has pretty much the same layout and design. Outstanding choice of colors! Remarkable! Its actually amazing post, I have got much clear idea on the topic of from this post. Hi there it's me, I am also visiting this web site daily, this web page is genuinely pleasant and the viewers are really sharing good thoughts. Oh my goodness! Amazing article dude! Thank you so much, However I am having problems with your RSS. I don't understand why I cannot join it. Is there anybody having the same RSS issues? Anyone that knows the answer will you kindly respond? Thanks! !